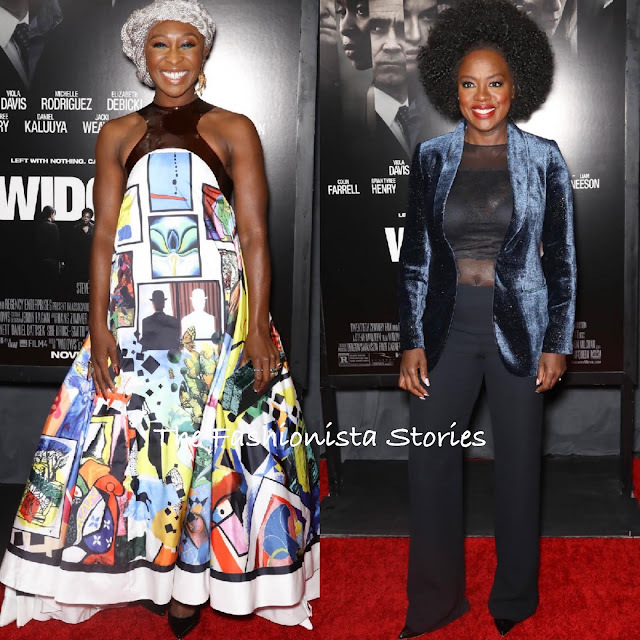 Continuing the promotions for their film 'Widows', Cynthia Erivo, Viola Davis, Michelle Rodriguez and Elizabeth Debicki attended a special screening last night(November 11th) at the Brooklyn Academy of Music in New York City. Cynthia Erivo wore a colorful graphic printed, voluminous halter dress courtesy of MARY KATRANTZOU. Her SPRING 2019 dress was accessorized with a EDIE PARKER clutch and PAUL ANDREW pumps. Viola Davis wore a sheer top which is something that I don't think that I have ever seen her in. Her top was teamed with a navy velvet blazer and black trousers. The pants needed to be hemmed but this is not a bad look and her beauty look is flawless as always. Michelle Rodriguez wore a simple black off-the-shoulder JILL STUART dress which featured a satin waistband and slit detail. To keep her subtle sultry look from being boring, she wore wore metallic SAINT LAURENT pumps. Elizabeth Debicki wore a black GIORGIO ARMANI ankle length dress which featured a satin panel v-neck and cuffs. I am not saying this is a bad look but it doesn't excite. I feel like a statement necklace and/or was needed.